I very much enjoyed our last Leadership20 webinar that addressed Instructional Leadership. There were a lot of things discussed that I agreed with, and was in fact doing. I went back to check through my blog and the entries that referenced this particular Principal Quality Standard. There were none other than my Professional Growth Plan entry on the topic. One of the tings that came up in the webinar was getting into classrooms. I do try to get into every classroom every day, but they are usually brief visits. This year I have tried to get in a lot more. Particularly in Grade one. One of the grade one classes has an EA in the morning but not in the afternoon. I try to pop in to that classroom and help out whenever I can. There are a couple of students that can really benefit from one-on-one time and when the teacher is by herself, she just can’t get to every student. By being there, I am offering a bit of help, but I am gaining insight into what it takes to be a grade one teacher. It’s a grade level I have never taught – other than music. 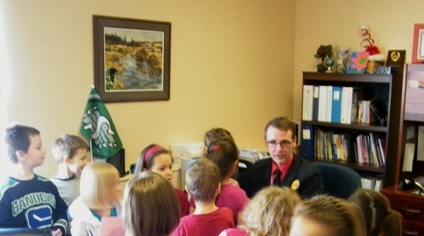 I have also filled in in another grade one class, rather than call a substitute teacher for an afternoon. I really enjoyed doing this and in discussion with the teacher decided that I would come in and observe her teaching language arts to the class, and possibly do a lesson myself. I think the term Instructional Learner might be a better appellation than Instructional Leader.